A black rhino cow was found shot on the morning of Friday 20 th April 2018 in the Stols Nek area in the KrugerNational Park. No spoor was found near the carcass. On Sunday 22 nd April 2018, rangers and vets flew over thecarcass to see if there may have been a calf nearby. A young calf was spotted near his mother’s body. The calf was darted at 4pm that day and slung under the helicopter to the safety of the Skukuza bomas in the Kruger National Park. 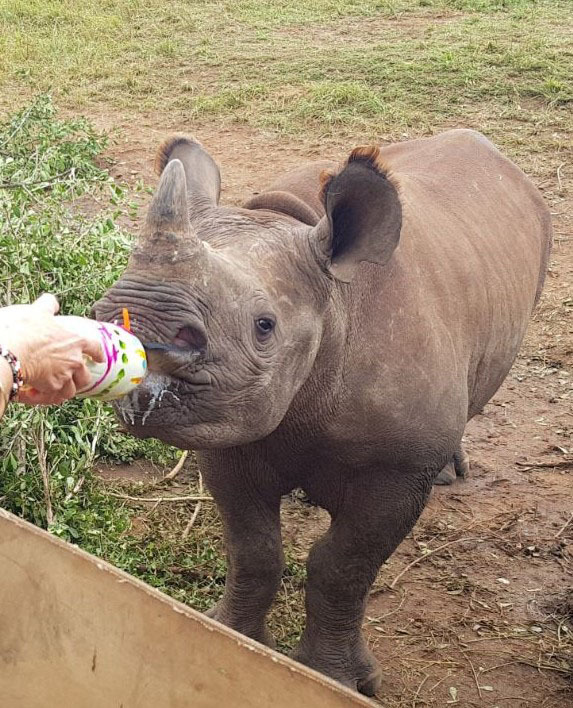 Care for Wild Rhino Sanctuary staff, together with Mpumalanga tourism and Parks Agency veterinarian, Dr Ferreira du Plessis, collected the black rhino bull calf the next day. The calf was transported in a crate to Care for Wild RhinoSanctuary where he was monitored at the Intensive Care Unit. On the 24 th of April 2018, the Black Rhino Calf was moved to the quarantine boma nightpen for a day to settle. The next afternoon, he was allowed into the boma area where he could enjoy the grass under his feet and the freshbranches that were brought to him daily. Ratu, as he is now called, was introduced to the other two young orphaned black rhino calves, Phoebe and Badger onthe 3 rd of May 2018. Phoebe, the older female, was a bit nervous with the introduction of Ratu, but Badger washappy to have another bull in his crash. Ratu, Badger and Phoebe now stay in one boma together where they eat, sleep and play together. We are so happy to see Ratu integrate so well with the other orphans.